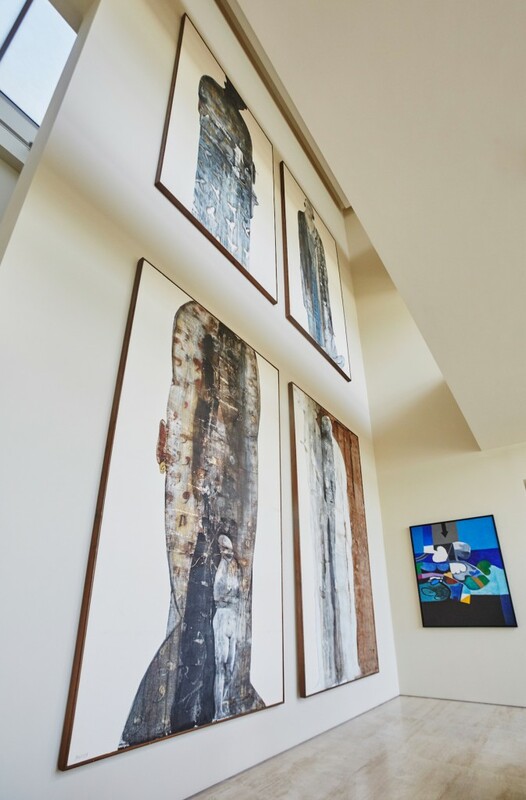 Used to dream of becoming an artist and graduated from art school in the United States, Maliha Tabari started collecting Middle Eastern art in 2001. With a collection of around 200 artworks now, she has witnessed the previously emerging artists to become established ones, while also contributing actively to the flourishing art scene in the Middle East. Maliha Tabari shared with Larry’s List her latest purchases of large sculptures, as well as her ambitions to establish a foundation and an open-air museum to showcase Middle Eastern sculptures, on top of creating a mobile application to connect people together. I started collecting art as soon as I graduated from art school in the U.S. When I returned to the Middle East, I started visiting artists’studios to connect with them and their artistic processes. I visited artists’ studios across the Middle East, including the UAE, Egypt, Lebanon, Syria, Saudi Arabia, Qatar and Jordan. I hope one day I can do the same in Palestine and Iran. Being an Arab, I knew I wanted to build a collection around art from my region, and to create a strong dialogue with the West. I fell in love with art at a very young age hence my dream of being an artist. I particularly fell in love with the Impressionist movement and tried to replicate van Gogh’s The Starry Night many a time! The brushstrokes and the way he painted with so much emotion spoke to me. There’s an aggressive expression in the way he paints; even though the subject isn’t aggressive, the way he paints is. I saw a reflection of myself in it – the drive and the emotion. 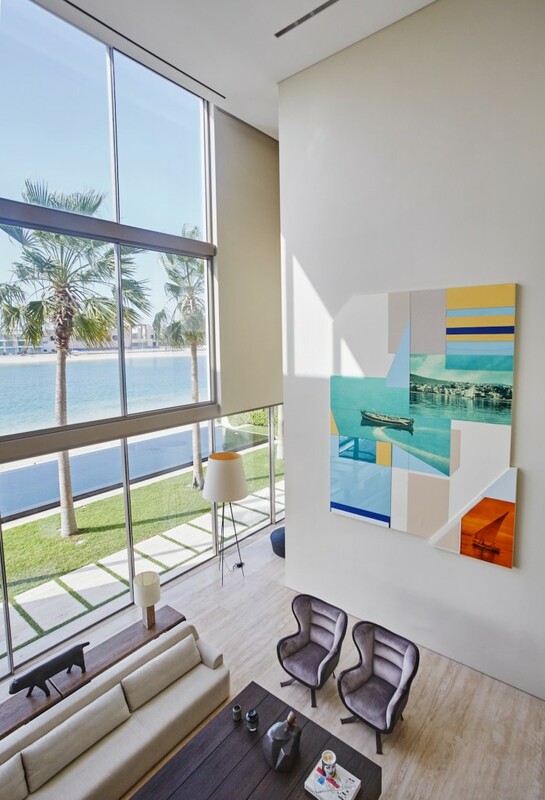 Brightly lit living room with a work by Hazem Harb. Courtesy of Maliha Tabari. When I started collecting Middle Eastern art in 2001, the artists were considered emerging and are now established. I like collecting and supporting Palestinian artists who explore the topics of identity and home; Egyptian artists who explore aspects of ancient Egypt, cinema and spirituality, as well as Saudi Arabian artists who explore political topics and expand upon the concept of religion. I appreciate art that has a fine art quality to it and artists that have a strong identity, messages and a story. Collecting sculptures is important to me as well, and I’m particularly fascinated by figurative works. Khaled Zaki and Parviz Tanavoli. Courtesy of Maliha Tabari. First was a few Adam Henein sculptures from Egypt, he is one of the most important artists in the Middle East from the modern period. The most recent work I bought was by contemporary Palestinian artist Hazem Harb. I commissioned a 7-meter work that is made with an archive photo taken in 1942 of an image in my home town in Palestine. I also purchased a 2-meter sculpture by the Yemeni artist Nasser Al-Aswadi that I placed in my garden. 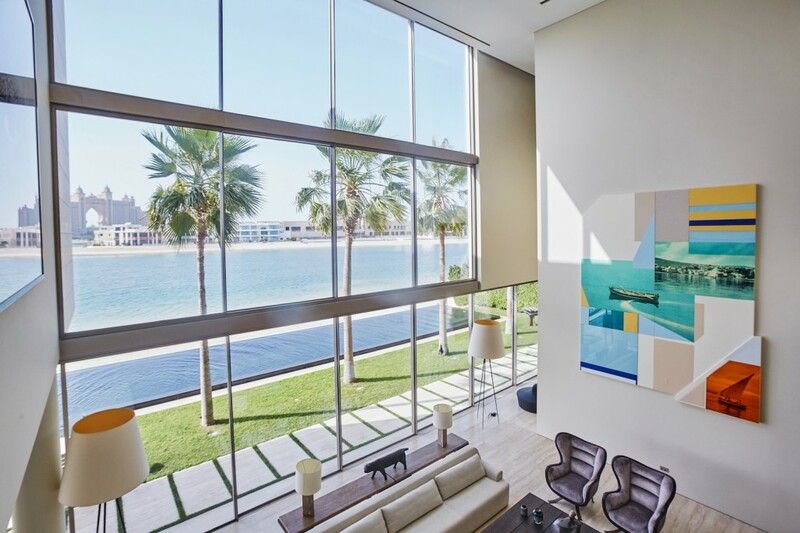 I own around 200 artworks, some of which are displayed in our house in Dubai, other works are in storage or in other homes we own. I try to loan my artworks to museums and foundations that are looking to showcase key artists from the Middle East. Safwan Dahoul, together with Ahmed Mater’s “Magnetism Series”. Courtesy of Maliha Tabari. Yes, I do wish to start a foundation and an open-air museum showcasing sculptures from our region. This is something I would like to explore in the future – I am not sure about the location yet but I’m hopeful to keep it in the region. You went to art school yourself. How has that influenced your perception of art and your collecting? I spent my time as an art student exploring and finding myself. After moving from Saudi Arabia, I had a lot of creativity and emotion that needed to be expressed. Once I completed my education, I realized I can provide a voice for the art world back home. I wanted to nurture artists, tell their stories and support them. My goal has been to create greater awareness about the Middle Eastern art scene internationally. When I started collecting in 2001, artists from our region weren’t fully recognized. I’m most proud to see Middle Eastern artists recognized in the East and West and have their works showcased at international biennales, museums and foundations. 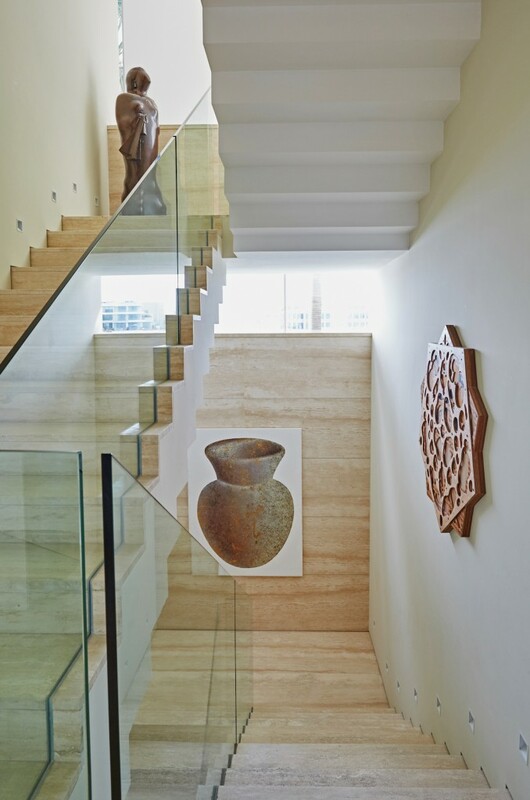 At the staircase are Farad Moshiri, Hayv Kahraman and Adam Henein’s “Om Kalthoum Sculpture” (based on famous musician). Courtesy of Maliha Tabari. You said in an interview last year that your dream is to create an app that connects people together. Do you still have this dream? How do you plan to realize it? Yes, I am working on that now – it’s a lengthy process! Adel El Siwi’s 4 Panels and a piece by Dia Azzawi. Courtesy of Maliha Tabari. Can you name emerging artists from the Middle East who should be on our radar? Adel El Siwi, Khaled Zaki, Hazem Harb and Lulwah al Homoud are really starting to branch out and become internationally recognized. They are working on great projects and have collectors looking into them. All of whom have their works in European and American institutions as well as in Middle Eastern ones, both private and public. The art scene seems thriving in the Middle East in recent years while you have worked in the scene already since 15 years ago. How do you contribute in boosting the development of contemporary art there? The art market has grown by having prestigious auction houses, international art fairs, and most importantly, a great roster of local and regional galleries promoting regional art from within. On top of that, institutions have begun opening up in the past few years. All of these factors have increased interest from the west. Now people are looking into Middle Eastern art on private, public and institutional levels which has been a great development, as this has allowed the regional artists to gain recognition abroad. At my Dubai-based gallery, Tabari Artspace, we are extremely dedicated to nurturing artists from our region and creating a bridge for them with the West. We have placed our artists in many important collections. We also commission academic texts on our artists, this is vital in the progression of things and something that has taken place in the West for centuries, but sadly it wasn’t as cohesive in the Middle East. We are building the artists of the future. In addition, I try support several non-profit organizations that promote Middle Eastern art and we remain involved in both professional and private initiatives that create awareness about Middle Eastern art across the region. Commissioned artwork by Hazem Harb, “Tabaria Series”. Courtesy of Maliha Tabari.